There are tens of thousands of Muslim refugees flooding into Europe from Syria and elsewhere, allegedly to escape war and violence. Apparently, Muslims, like Socialists, like to flee the hell-holes that their ideologies create. However, whenever they have escaped to more enlightened locales, they then begin re-establishing the ideology from which they fled. Some say the "refugees" look more like invaders than the poor, down trodden wretches we generally associate with the the term. 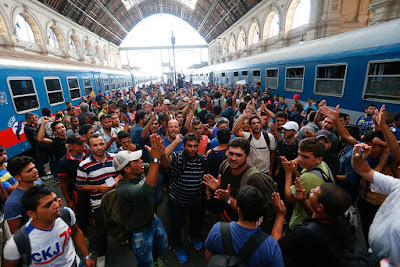 Invasion by immigration, and conquest by population replacement, are in the offing. What we are witnessing is a successful strategy for Islam to conquer the west, by a slow and patient kind of subversion. They are aided in this by liberal politicians who strike poses "welcoming the immigrants," because the highest point of enlightenment is to sacrifice one's own culture, language, customs and religions for decidedly inferior ones. Let our grandchildren grow up in totalitarian hell-holes of poverty and oppression! Their sacrifice is worth the opportunity to strike poses in the here and now, for fellow "enlightened" self-hating leftists, and the ecstasy that moral vanity brings. The "refugees" should be turned back. Let them enjoy the fruits of their sacred culture. They have spent centuries building it, now let them enjoy it to the fullest. We do not need this disruptive, violent and hostile culture in our midst. See it for what it is, an invasion by hostiles, who come not to assimilate into our culture, but to replace it with theirs. It is a process known as stealth jihad.